Ruins of the Ancient Ones, the "Puebloan" cultures, and their rock art are found in abundance around the Four Corners. From the Four Corners the famous Mesa Verde cliff dwellings lie to the northeast in Colorado. The Hovenweep towers lie to the northwest in Utah. 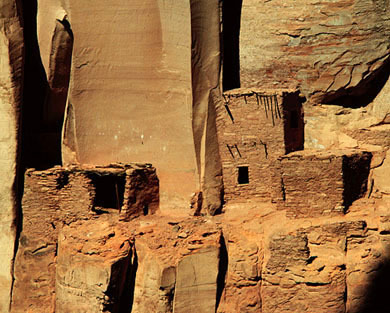 Three of the most spectacular cliff dwellings, Keet Seel, Inscription House and Betatakin, are located in Navajo National Monument to the southwest. A profusion of ruins and rock art are found in Canyon de Chelly National Monument to the south. To the southwest lies Hopi land, with occupied pueblos and possibly the longest continuously inhabited town in the United States. And to the southeast in Chaco Canyon, New Mexico, the Puebloans constructed more than a dozen large pueblos. The largest, Pueblo Bonito, had an estimated 650 rooms and 32 kivas and stood four and in places possibly five stories tall. The rock art of the region is one aspect of a culture that created great art, masonry, roads, pottery and other artifacts. 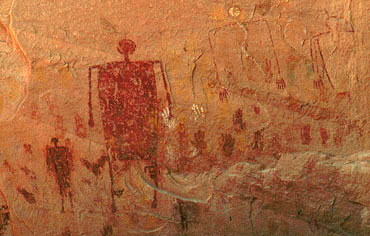 It is in this context that the rock art must be considered. 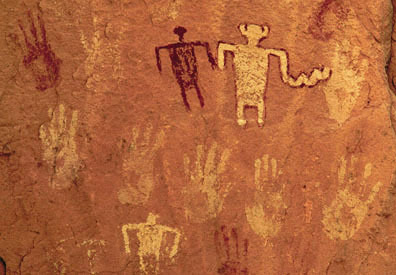 The amount of rock art created by the Puebloans is voluminous. One important site is featured on this page and the amount of pictography at the site is more than one web page can convey. One of the greatest concentrations of pictographs is located in the midst of all the well-known Puebloan ruins, at the site called "Painted Cave." None of the well known ruins can boast the uncommon great number of wall paintings which decorate Painted Cave from one end to the other, spanning hundreds of feet. Our modern vocabulary must be used selectively to describe this ancient ambient. The "wall" painted here is not two dimensional, but rather the natural, rough, varied, multicolored, multidimensional sandstone recess, the back wall of a natural shelter. The "cave," wider than deep, is merely a cliff overhang, the cave floor is the top of a talus slope, a steep mass of sand and broken rock against the cliff. Most of the art is attributable to the pre-ceramic or Basketmaker cultural period. Eventually 15 rooms and a kiva were built. Evidence unearthed during excavation indicated occupation prior to the ± 400 A.D. pottery horizon, therefore long before the Puebloans began building masonry walls. Only a few of the stonewalls survive today, the tallest about 7 feet. Two rooms remain enclosed. Adobe plaster still coats the kiva interior. Tree ring analysis determined that the kiva's now-downfallen main roof beam was felled in the summer of 1247. The portions of the cliff painted after walls provided easy higher access may be of approximately the same vintage, though the art is stylistically uniform. At many masonry sites rock art on the cliffs is equated with building roofs providing access. Note the pictographs in the following image, a view of Betatakin Ruin. More than 1000 handprints, mostly paired and vertically oriented, predominate the Painted Cave "canvas." 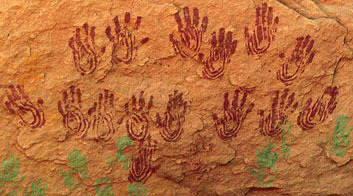 Handprints are the most common rock art element found around the world. A technique used since the Neolithic is spraying around the hand placed resulting in a negative image. The common type, the positive print, is made with pigment applied to the hand and transferred to the rock. In Puebloan pictography zigzags, lines and whorls painted on the hand provide variety. At Painted Cave they are most commonly red. 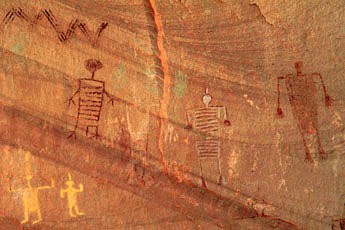 The pictographs are painted directly onto the cliff as opposed to applying a painted hand or silhouetting a hand by spraying. One pair has six digits per hand! Human-like figures are the other important element. The about 50 anthropomorphs, mostly of Basketmaker origin, range in size from 6 inches to 5 feet. Several are embellished with projections from their heads, others have distinctive stylized heads. Wavy lines, triple-lined zigzags, triangles and a square complete with immense, aboriginal creation. Red, green, yellow, white and blackish-brown are the ancient paint colors. I also found inscribed the following: "VIII Bernheimer Exp. 1930 Am Mus Nat Histy NY J.W. G.O. E.R.M. C.I.B." Ravens were calling and a songbird sang loudly when I visited this remote location on the Navajo Reservation. It was sunny and breezy. Water was flowing in the canyon's deep ravine below the cave. Excepting the downfallen walls there was no evidence of time's passage since the Puebloans painted the cliff. Near the canyon entrance we had spoken with a Navajo elder, who provided final directions and permission. If you explore this region be conscious that visitation ethics are distinct on Reservations, which are not public lands. Permission must be acquired and often a guide is required. It is also important to be sensitive about local preferences about visitation. Unlike on public lands, on reservations rock art is often someone's back yard. Imagine how you would feel if anthropologists intruded in your back yard on a regular basis. 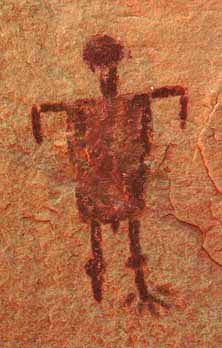 This virtual tour of Puebloan rock art continues on the NEXT page.